An estimated 275 million people suffer from anxiety disorders. The early years of the 21st century have witnessed a worldwide epidemic of poor mental health and related illnesses. But while depression is the condition most will associate with mental health issues, and the leading cause of disability worldwide, it is not the number one mental health concern people face. That unwanted accolade goes to anxiety. An estimated 275 million people suffer from anxiety disorders. That’s around 4% of the global population, with a spread of between 2.5% and 6.5% of population per country. Around 62% of those suffering from anxiety are female (170 million), compared with 105 million male sufferers. By 2030, the cost to the global economy of all mental health problems could amount to $16 trillion. 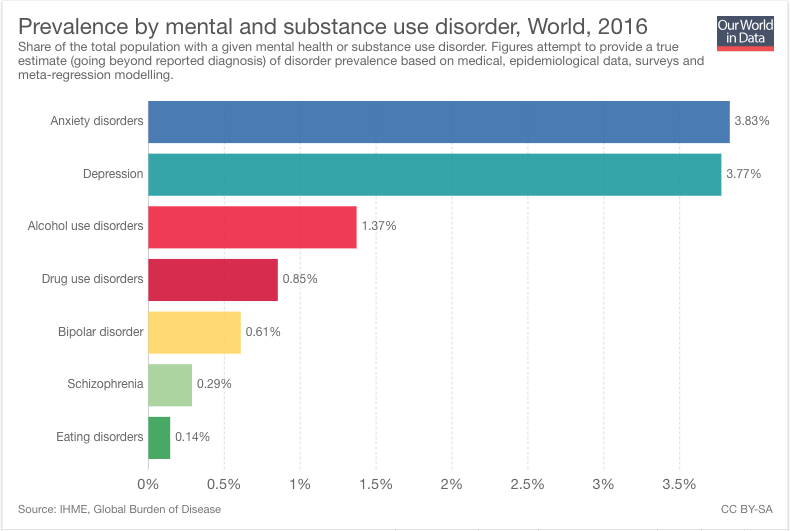 How the world confronts mental health challenges, which are a blight on a growing number of people’s lives as well as an economic encumbrance, is on the agenda at the World Economic Forum's Annual Meeting 2019 in Davos. The Duke of Cambridge, Prince William will be attending Davos 2019, where he will talk about Mental Health at Work, his initiative to improve emotional and mental wellbeing in the workplace. "Health systems have not yet adequately responded to the burden of mental disorders. As a consequence, the gap between the need for treatment and its provision is wide all over the world. In low- and middle-income countries, between 76% and 85% of people with mental disorders receive no treatment for their disorder. In high-income countries, between 35% and 50% of people with mental disorders are in the same situation."